Lets see the list when it comes out. I understand they have to test and examine it. If it doesn't pass, then it is another propaganda. Wouldn't be the first time CCP tried it. It is not very important which computer is fastest. Having the fastest means nothing, but having lots of fast machines will make a serious difference in your MIC. What is important is that China has recognised the usefulness of a super computer. Something the Soviet Union did not unfortunately. That is why most electronics in Russian stuff is made in foreign countries. Perhaps a goal for this new silicon valley concept in Russia should be to work on relatively cheap but fast computer designs. I remember a while back a Russian electronics company suggested using the processors currently used in 3D graphics cards that had built in physics chips as cheap CPUs. They are certainly fast enough and very cheap to buy and use in numbers. They are also designed to come on their own cards with their own cooling and memory so in a way they are already ready to be networked into one large machine. They are already programmed to operate as part of a distributed processing network because in most modern computers you can have two or three or more cards linked together using various methods. Having advanced computer power would drastically improve design work and reduce time required. Wind tunnels and real testing would still be useful, but for testing a lot of different ideas rapidly it is ideal. The more different ideas you can test the more features you might find that effect final performance. I hope Russia decides to join this race but keeps in mind that the focus should be on practical machines that can actually be made and used rather than one off machines that need specialist coding and software to run. I have seen enouggh of the NVIDIA & ATI Radeon graphic cards that were fabricated in China & this also applies to computer motherboards. Except the processor everything is Chinese. Is the same applies to Russia>>>>I dont think so. NVIDIA & ATI Radeon graphic cards are not Chinese... everything in that computer is made under Taiwan companies under US brands. The Russians didn't make things small because they didn't have to... they had rockets that were powerful enough to lift the extra weight. The Chinese are not developing small electronics, they are merely making it in factories designed in foreign countries equipped with machine tools and robots designed and made in foreign countries. The only reason these factories are in China is because the labour is so cheap and there are no workers rights so you can screw the workers and not have to pay out large amounts for anyone getting killed or injured. This will change in time. In the mean time the Russian military officials have said they want to improve their technology base and they are prepared to pay money for it. The difference is that after the Russians set up factories to make small electronics they will also learn how to improve them and make stuff of their own design for their own needs. Except the processor everything is Chinese. The processor is the only hard bit to make. Russia can already make all the rest, the controller chips, memory cards, transistors and capacitors, power supplies etc etc. China is making lots of improvement at nano-scale. If you look at the annual publishing rate of patents from Chinese in the respective field they are quiet heavy in nature!! Here is the Chinese patent process... government waives the filing fee, person files foreign patent and claims it their own. CCP official stamps patent and adds it to the list. Or, person thinks they have a great idea, any other patent office would not grant it, official stamps it anyway, add it to the list. Point of the story, Chinese patent quality is BAD! MOSCOW, March 30 - RIA Novosti. State Corporation "Rosatom" passed on to JSC Company Sukhoi, the first compact super computer with a Russian software productivity of 1 teraflops (1 trillion of floating point operations per second), reports on Tuesday RIA Novosti correspondent with the ceremony of transfer of the sample. The supercomputer is designed by FGUP Russian Federal Nuclear Center VNIIEF, located in the city of Sarov, Nizhny Novgorod region. This machine can simulate the gas-dynamic processes, investigate aerodynamics, as well as do other calculations. In 2011, it will be possible shortchanging models of hydrodynamics, turbulent mixing, and in 2012 it will be possible to calculate the model of acoustics and heat and mass transfer. Thanks to these ideas "Rosatom plans to build a database, which in turn, will allow aircraft builders from 2012 to begin an integrated simulation modeling. Creation of the first sample of compact supercomputer will enable the next phase to begin limited production of these computers. By the end of this year, VNIIEF plans to manufacture and pass on to users 14 super computers. Among users - the nuclear industry companies, Roscosmos, KAMAZ, as well as Aircraft Association "Saturn". According to Director General of Sarov nuclear center Valentine Kostyukova, hardware-software system (super-computers), national production will create a competitive product on the world market. " The cost of this super-computers 1,6 million rubles, and it replaces 50 conventional high-performance computers. In the future, mass production of these computers will reduce their cost by 20% in comparison with similar computer systems, supplied to Russia from abroad. In turn, the head of Rosatom, Sergei Kiriyenko noted that the state corporation, on the one hand, this is a commercial project, but on the other - it is a practical realization of development objectives in Russia supercomputer technologies. Kiriyenko also said that it was necessary to build up the system to work with supercomputers and the transfer of Sukhoi first super-computers, "this work started. In the United States you can go to the SETI website and link your computer to their server and your computer starts crunching data and reporting back to the server the results. How many computers around the world are hooked to the internet with high speed cable internet with Microsoft Vista/Windows 7? Could the US have secretly put in programming code to have people's computers become part of a supercomputer? Why not? That's how I'd make the worlds fastest computer....plus pass the costs on to people around the world and they wouldn't even know it. Meanwhile Russia and China would have to pour large amounts of money building super computers where everyone knows where it is...and they'd have a huge powerbill running the thing. Bad economics. I doubt the US could keep such a thing secret. Obviously they could keep it secret from their own citizens, but the Russian Intel would find out and that would make it very easy to deal with... set up computers and connect to the "supercomputer" and start uploading false information the computers have pretended to process. If indeed, the components are nvidia, and Intel, the first indigenous chinsese super computer with its shenwei processors is at 65 th. Russia 58. China has conducted an unexpected military mobility exercise, boarding a People's Liberation Army brigade from the Lanzhou military region on a high-speed train and sending them 300 miles to the western province Xinjiang, home to an insurgency fought between the state and ethnic Uyghur Muslim militants. The high-speed line to Xianjiang is the newest of six in the country, having opened in 2014. The need to move its army fast stems from the geographical enormity of the country and China's relations with neighboring states, of which there are 14. Ongoing border disputes with India, potentially unstable Myanmar to the south, Tajikistan and Kyrgyzstan to the west, and the country's border with North Korea explain China's striving to evaluate its military's performance in rapid movement, with sights set on the army being able to respond to various types of crises. For a country with such a huge territory and the longest land border in the world, handling the problem by using civilian infrastructure may indeed be a clever solution. "This new mode of transportation is an improvement. With troops now able to step out of their barracks and onto the high-speed train, troop movement will be significantly faster," OE Watch, the Army's Foreign Military Studies Office newsletter, noted in June. 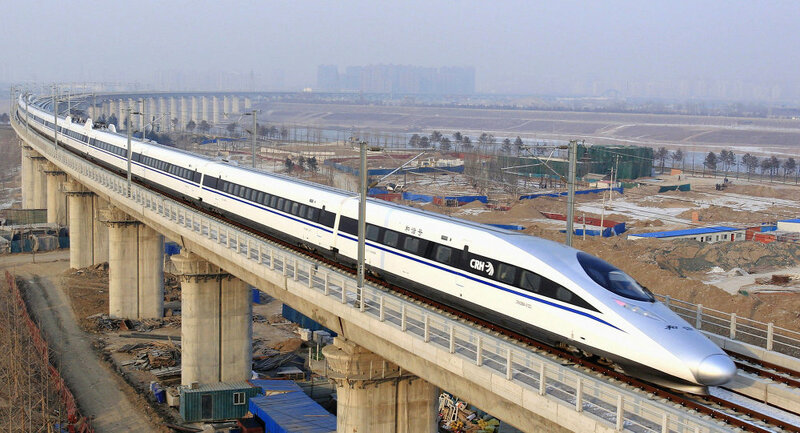 To date, China has the largest high-speed rail network in the world with trains traveling faster than 120 miles per hour. By the 2020s, Beijing plans to more than double the number of its high-speed lines. The Lanzhou brigade's trip was the first time a military unit had ever traveled along the high-speed rail line to Xinjiang, the Week reported. An analysis of the trial run held on June 2 evaluated the train fully loaded with troops, with equipment placed on the luggage racks and in the spare room at both ends of each carriage. China has announced that it is has begun assembling the Jiaolong (Water Dragon) AG600 – the world’s largest amphibious aircraft, according to the International Business Times. Currently, the first airframe is being built at a facility in Zhuhai in Guangdong province. The final assembly is scheduled to be completed by the end of 2015 with a first flight to take place around mid-2016. The designers of the plane proclaim the AG-600 as the biggest amphibious aircraft surpassing Japan's ShinMaywa US-2 and the Russian-made Beriev Be-200. The AG600 is capable of landing and taking off on water (and land) making it useful to other countries with many islands, such as Malaysia and New Zealand, who have already expressed interest in the AG-600. Back in April, a defense analyst observed that amphibious planes like the AG600 would be perfect for resupplying the new artificial islands that the Chinese are building in the South China Sea. Analyst further added that these islands would be excellent bases of operations for the AG600 to engage in maritime patrols of claimed territories. However, a Chinese aviation official stressed that the plane is also envisioned for export abroad. “Since the first day of its development, the AG-600 has been designed for the global market. We are confident in its market prospects because the aircraft’s overall specifications, such as the maximum take-off weight and flight range, are better than other amphibious planes in the world,” said Qu Jingwen, general manager of the China Aviation Industry General Aircraft Company, reports the Diplomat. Except that the A-40 has a max TOW of 95 tons and is rather bigger than the Be-200. "The People's Liberation Army may eventually equip its main battle tanks with electric reactive armor to prevent damage from anti-tank weapons, reports China's Global Times. Electric reactive armor is usually made of two electrical plates separated by an insulator to make a high-power capacitor. When a tank using the armor is hit by an incoming object such as a rocket or missile, it will discharge electricity from the capacitor to vaporize the object. The discharge is claimed to be powerful to turn the incoming object into plasma, said the report. From the Chinese perspective, the electric reactive armor is the best available defensive technology for tanks in the world and China is now capable of developing it, the report said." The 500-meter Spherical Radio Telescope (FAST) is being constructed in China’s Guizhou Province. It will be completed in 2016 and will become the world’s largest telescope, surpassing Puerto Rico's Arecibo Observatory which is “just” 300 meters in diameter. Previously, media reported that the US government had blocked the transfer of US companies' technology to four Chinese technical centers associated with Tianhe-2 suspecting that the supercomputer, powered by Intel-produced microprocessor chips, was being used to simulate nuclear explosions. MOSCOW (Sputnik) — China is willing to continue its cooperation with the US Intel Corporation on the development of the Tianhe-2 (Milky Way-2) supercomputer but intends to create its own capabilities to produce all the necessary system components, Chinese Vice Minister of Science and Technology Cao Jianlin told Sputnik. "Of course, we would like to cooperate with Intel, but if they are not ready, we can handle the task we are facing by ourselves," Cao said. He added that China was developing its own microprocessor chips and other necessary equipment for the supercomputer. "Of course, now we can not provide the supercomputer with only China-produced equipment, however, we are working in this direction," the vice minister said. He pointed out that Russia and China faced a common challenge of needing high-tech import substitution and could support each other in this respect. According to the TOP500 project, which lists the 500 most powerful supercomputers ranked by their performance, Tianhe-2 developed by China’s National University of Defense Technology and located in National Supercomputer Center in Guangzhou is the fastest system in the world. Its good how he pointed out that they and Russia can work together. This could be a big help to MCST in providing the necessary computers and produce enough of them.